Shane Slater from Wolverhampton needed graphic design and print for a flyer, for distribution around the Wolverhampton area. 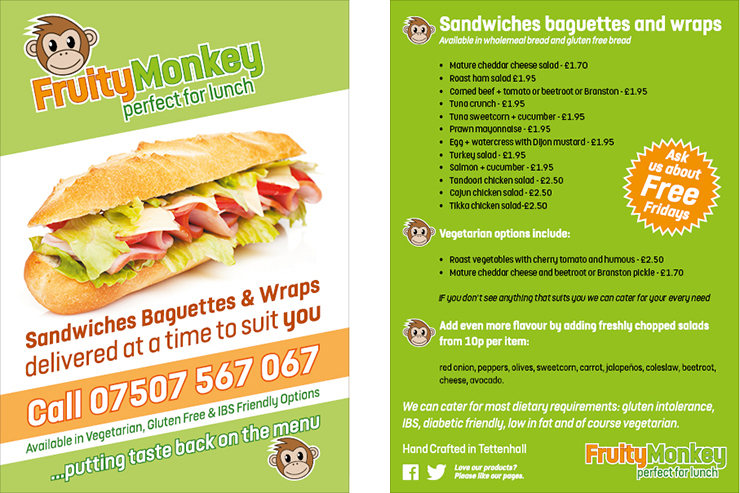 Fruity Monkey delivers freshly made sandwiches, baguettes and wraps to customers' workplaces. Although he needed a logo designing, as part of the job, Shane had already decided that the existing business name should be the basis of the graphic design concept. At a meeting, in Wolverhampton city centre, we talked about his enterprise and his aims for the future. In many ways Shane is the ideal graphic design client: he had a very specific and well informed idea about what he wanted, in a logo design, yet was very open to advice. It was obvious to us both that the logo should contain the image of a friendly looking monkey. It should also work well in print, as an embroidered feature on work uniforms, on large format printing and on the side of a delivery vehicle. The first task I set myself was to design a friendly monkey face. I searched the internet for all sorts of drawings of monkeys, both realistic and heavily stylised. I felt that my drawing should be as simple as possible, that it should convey the essence of "monkiness" with as few lines as possible. Not only would such simplicity result in a more elegant graphic design, it would also print better when very small. Having gained an understanding of the various ways monkey faces can be depicted; I began by simply using a large circle, two small circles and three identical ellipses to create the basics (above left). Once I was happy that these six elements worked together well, as an abstract graphic design, I then added the facial features. To maintain the design's simplicity; I only used circles or the same resized ellipses, throughout (above, second from left). The mouth is also a sector of the same ellipse. Leaving the shape unfilled meant that I could see all the lines in the drawing. This helped me to make sure that all the elements were positioned well. Once I was happy with this, I filled the shapes in with white; except for the eyes, which are black (above centre). Having produced a simple black and white image that seemed to work well; I then coloured it in, with two shades of brown (above, second from right). At this point it seemed to me that, taken on its own, the subject could be taken for a chimpanzee. Although both apes and monkeys share the same basic primate features; I thought might make the difference clearer by adding the crest of hair, shown on the final version (above right). As with the mouth, this feature was also created from sections of the same ellipse; used to create the other features. Once I was happy with the monkey face, I looked at a variety of typefaces to use for the rest of the logo design; before finally settling on FS Dillon. Designed by Jason Smith in 2009 and available from www.fontshop.com , this family of fonts is very versatile. An easy to read, yet distinctive, sans-serif typeface; FS Dillon is suitable for both headlines and body text. Having used the bold and regular fonts from this typeface, for the logo, I was still left with four other fonts to use in the flyer graphic design. This helps to create visual interest while at the same time maintaining consistency. The use of orange and green, in the logo's lettering, was an almost instinctive choice. I feel that together these two colours convey freshness, naturalness, fruitiness, optimism, warmth and lusciousness - and a certain "jungliness", of course. "As soon as I saw it I was blown away"
A graphic designer could not hope for a more positive response. Usually a logo requires several rounds of revisions and client feedback, before it is completed. However in this instance; the clarity of Shane's brief meant that it was more likely that I would hit the nail on the head, on the first attempt. Shane and I had decided at our first meeting, that once he was happy with a logo, we ought to keep the flyer graphic design relatively simple. There were three reasons for this. Firstly we wanted the logo to be the primary visual feature, so that clients would better remember it. Secondly the flyer needed to contain quite a bit of text, for its size, so too many graphic design features would leave it looking cluttered. Thirdly the budget needed to be weighted toward the creation of the logo, which was to be a long term asset. As you can see, the finished print ready layout is almost like two separate graphic designs. Indeed this is because it needs to fulfill two functions. The front side is a conventional flyer, featuring the corporate identity of the business and its produce; along with a contact number. Except for the logo, the text is in italicised FS Dillon fonts. Having worked out that these italics lean at 11°, I decided to slant the artwork by the same amount. This very simple trick gives the graphic design something of an "onwards and upwards" feel. I have used a slightly lighter green on the front so that the logo stands out and so that the vividness of the colour does not compete with the image of a rather tasty looking baguette. The reverse side is a simple menu. The green background is a more vivid, deeper version of the same green that features on the front. This was necessary so there is a more or less equal contrast between it and both the black and the white text, when it goes to print. The exclusive use of fonts from the FS Dillon typeface family, provides an easy visual unity for both side of the graphic design and subtlety reinforces the corporate identity. The finished graphic design was printed as 500 A5 double sided leaflets, on 150gsm glossy stock (code LEGA54T). These have the same outstanding 400 dots per inch print resolution as heavier, premium, printed products. However at 150gsm, they are noticeably heavier than a high quality letterhead. See my Services page here.